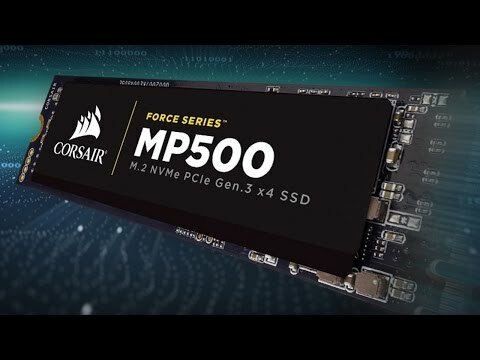 The 240GB MP500 is a high-quality SDD that delivers incredible performance thanks to its easy to install M.2 form factor that is just 3mm in height, the Corsair MP500 SDD’s technical highlight is PCI-Express 3.0 x4 interface, which is the latest NVMe standard. This drive in particular has a storage capacity of 240GB, a with read speed of up to 3000MB/s and write speeds of up to 2400MB/s which delivers ultra-fast system boot times and less load times. The Corsair Force MP500 series M.2 SSDs deliver high performance, quick system boot ups, blazing fast transfer speeds and ultimate reliability in a compact form factor. CORSAIR NVMe M.2 SSDs enable a new level of performance in a compact form-factor. The CORSAIR NVMe PCIE boosts bandwidth, allowing you to access all of your data, load files and launch games with speeds up to 4x faster than SATA 3.0.